Red rind cheese with a piquant, full and nutty flavor. 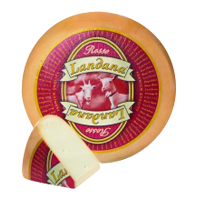 Landana Goat cheese ROSSO is prepared in the same traditional way as all other Landana goat cheeses. However, the method for maturing Landana ROSSO is quite different: in special rooms with an atmosphere like that of underground caves. During this maturing, the cheese is turned by hand and washed on the outside with a mixture of brine, white wine and corynebacterium culture, which results in the distinctive color and full, elegant flavor of Landana ROSSO.